Kharkhorin - In 1220 Chinggis Khaan established the capital of Mongolian empire on the fertile plains along the Orkhon River. This is called Kharkhorin, 373 km from Ulaanbaatar city. Kharkhorin is located at the lower end of the upper valley of the Orkhon River, which is part if the World Heritage Site Orkhon Valley Cultural Landscape. The location marks the eastern foothills of the Khangai Mountains. Kharkhorin town population is 8,977 (2003), city area is 20.5 km2. Kharkhorin was a busy spindled city with high civilization built by the best artists and masters of antiquity. But it was completely destroyed in the fierce battles of the internecine war. Quite surprise for the scientists was the discovery of a burial of Mongolian women which dates to approximately the 14th century were also two Egyptian masks, a wooden comb and bronze mirror in a case were found-shows ancient relationship between the nations. The foundations of Karakorum's buildings are all underground and little has been excavated, so you need lots of imagination when contemplating the grandness of it all. The plain was littered with bricks, ruined walls and pillars until the mid-16th century. The stone, blocks and other building materials from ruins of Kharkhorin were used in the construction of this monastery. 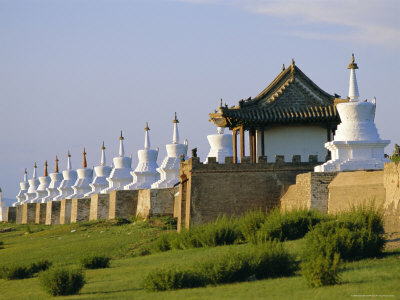 Erdene Zuu Khiid - The first Buddhist monastery called Erdene-Zuu was built on ruins of Kharkhorin. It was built in 1586 at the initiative of Avtai khan, most influential Prince of that time in MongoliaThe monastery occupies an area surrounded by a stone wall with 108 stupas lining on it. 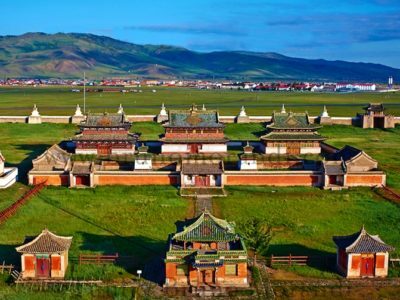 The Erdene-Zuu monastery preserves marvelous works of Mongolian artists, painters, cutters, sculptors, embroiders and craftsman of the XVII-XIX centuries. It had between 60 and 100 temples, about 300 gers inside the walls and, at its peak, up to 1000 monks in residence. Erdene zuu Monastery was destroyed by communists in 1930s during the political purge. Suprisingly, many Buddha images and statues, tsam masks and thangkas were saved by locals. The monastery was closed until 1965 and reintroduced as a museum to public. After democratic revolution in 1990, religious freedom was restored and monastery became active again. The monastery is enclosed in an immense walled compound surrounded by 108 stupas. The three temples in the compound, which were not destroyed in the 1930s, are dedicated to the three stages of Buddha's life: childhood, adolescence and adulthood. 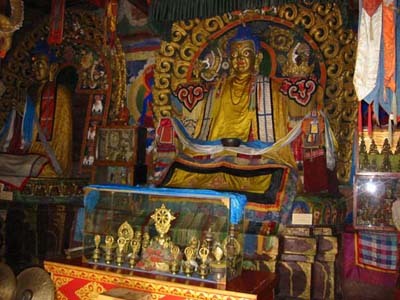 Dalai Lama Temple was built in 1675 to commemorate the visit by Abtai Khaan's son, Altan, to the Dalai Lama in Tibet. The temple accommodates statue of Zanabazar and some fine 17th-century thangkas depicting the Dalai Lamas and various protector deities. Stone Turtles - Outside the monastery walls, there are two stone turtles. Four of these sculptures once marked the boundaries of ancient Karakorum, acting as guards of the city. The turtles originally had an inscribed stone stele mounted vertically on their back. Next to the Turtle Rock you can see an area of raised earth surrounded by a wire fence. This was the alleged site of Uguudei Khaan's palace, who was third son of Chinggis Khaan.